San Pedro de Atacama is not only an oasis within the world’s driest desert, it is the gateway to an adventure and nature lover’s paradise. 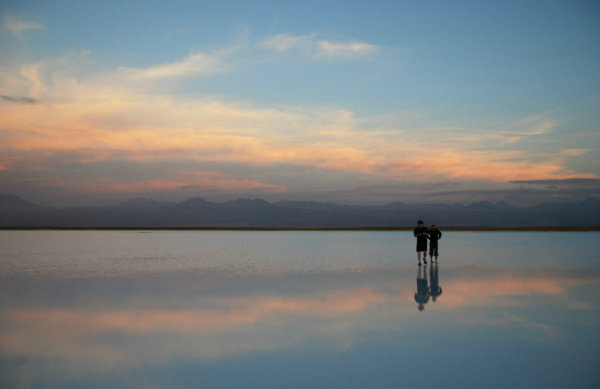 With everything from salt flats, coloured lagoons, volcanoes, rocky mountain valleys and even the Andes in the distance. If you had to describe this highlight in the north of Chile in a couple of words, ‘surprisingly diverse’ would be the start. 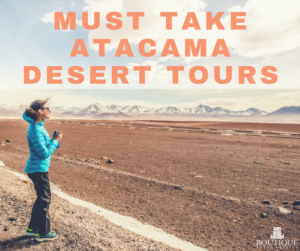 And with more than 30 different Atacama Desert tours available through which to explore this enthralling arid region, it can be hard to choose between them. 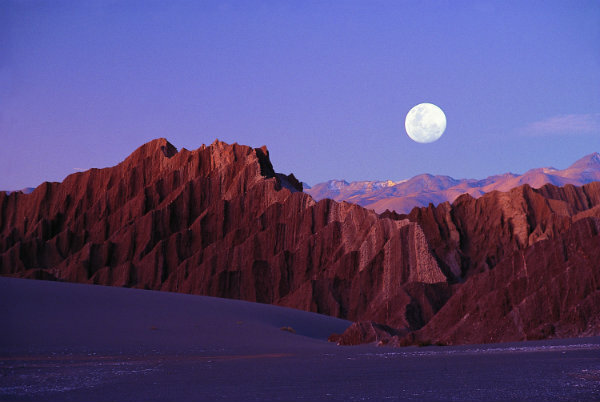 Moon Valley is the Atacama Desert tour to take for those seeking out of this world landscapes. As its name suggests, these mountains, caves, stone and sand formations look like those you would find on another planet, and there’s no surprise some of the testing for Mars space rovers were conducted in this environment. 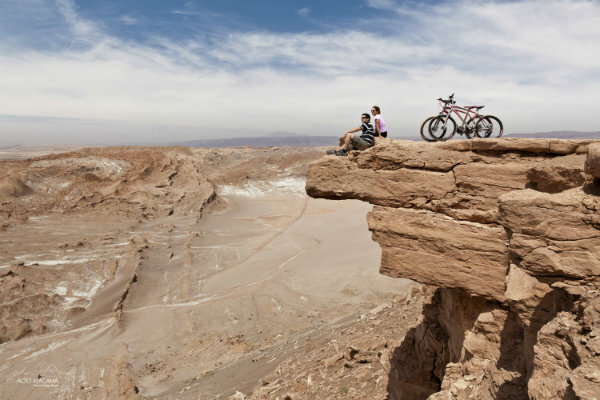 Located near the Salt Mountain Range and drier than other parts of the Atacama with dry lakes, Moon Valley is one of the most photographed spectacles in the north of Chile and with good reason. Vehicle or even mountain biking tours are popular ways to see Moon Valley and it’s best seen on evenings with a full moon. 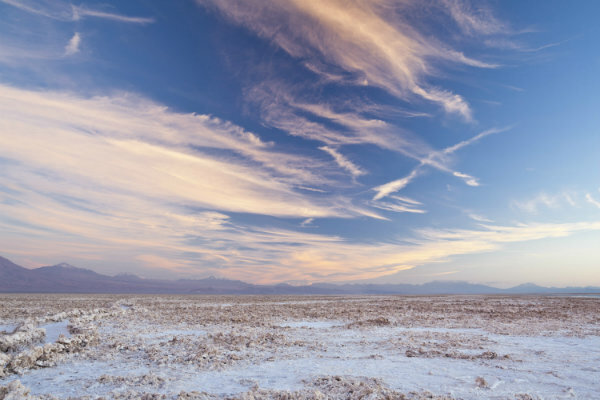 Did we mention that you can find water in the world’s driest desert? Rain does fall in this area closer to the Andes mountains, enough to form some intriguing water bodies which make for quite a spectacle when contrasted against the colours of the desert sky and horizons. Miscanti and Miniques lagoons were formed as part of ancient ice thaws and attract nearby wildlife who have adapted to the extreme conditions of desert living such as birds and the mirrored effect amongst the cloudless Atacama sky is captivating. The latter offers views of the volcano of the same name. And Tebinquinche and Ojos del Salar lagoons stand out as a highlight, with their crystal clear waters not just inviting, but their high lithium and salt concentrations make you feel like you’re floating in the dead sea. The view of the Andes in the background, is as beautiful lying on your back contemplating your serene surrounds as it is out of the water. 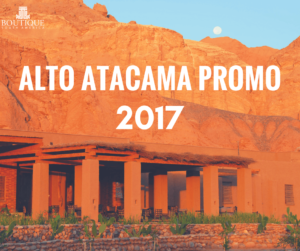 An Atacama Desert Tour to the highlands and Altiplanic lagoons is sure to be different to what you expected. Covering more than 3000 square kilometres, the Atacama Salt Flats are the largest in Chile. But it’s not all about the salt here, as imposing volcanoes such as Licancabur, Aguas Calientes and Lascar, dominate the surrounding skyline. On the north west side you have the Salt Mountain range and nearby is the flamingo reserve filled with small water deposits such as Chaxa, make it a popular spot for flamingoes. 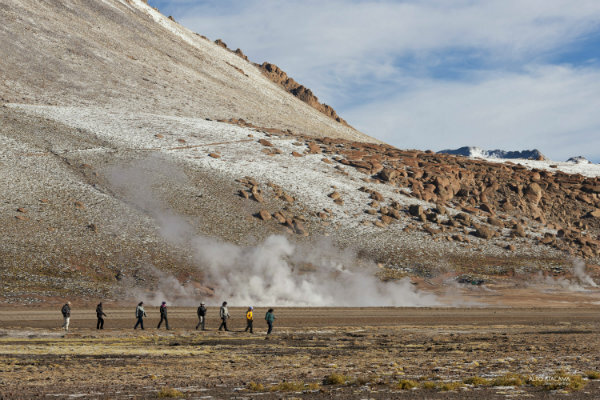 The geyser fields of El Tatio are one of the most unforgettable Atacama Desert tours and with good reason. Not only will you be drawn in by the hiss and splutter of the more than 80 individual geysers, but the setting against the imposing mountain filled backgrounds/with the Andes in the distance makes it even more remarkable. Most El Tatio Geyser tours are conducted in the morning, so you can watch these geysers appear as the sun rises in the desert. Tatio is located at 4,321 metres above sea level, so you should spend at least two days acclimatising to the high altitude of the region before visiting it. Atacama nights can be just as fascinating as your days in this world leading astronomical outpost. Even if you don’t know a single constellation, Atacama is the place to indulge your space and star filled fantasies. With several of the world’s best telescopes and observatories and close to zero light pollution, you will be wowed by the heavens and skies up above as much as you are by the beauty below. 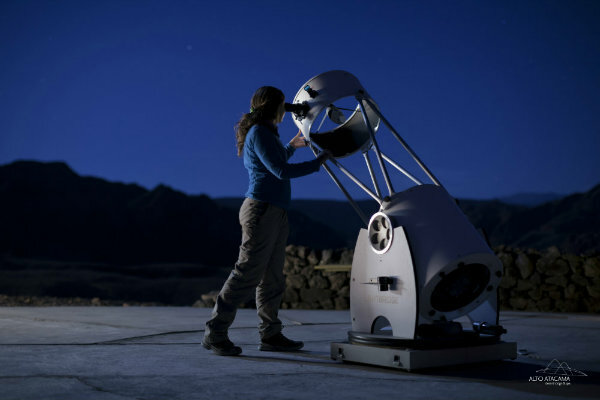 You can take a tour of a nearby observatory or some hotels like Alto Atacama even have their own telescopes from which to learn and absorb yourself into the star spangled heavens above.